The happening Co-ed group in South Korea finally hit Indonesia with their tour “WILD KARD in Jakarta”. BM, Somin, Jiwoo, J.Seph bringing the live version of their hit songs during the 1.5 hours show including the solo performance they’ve prepared for Indonesia fans. The show started with “Into You” and continued with their other hit songs such as “You in Me”, “Trust Me”, “Don’t Recall”, and “Rumor”. 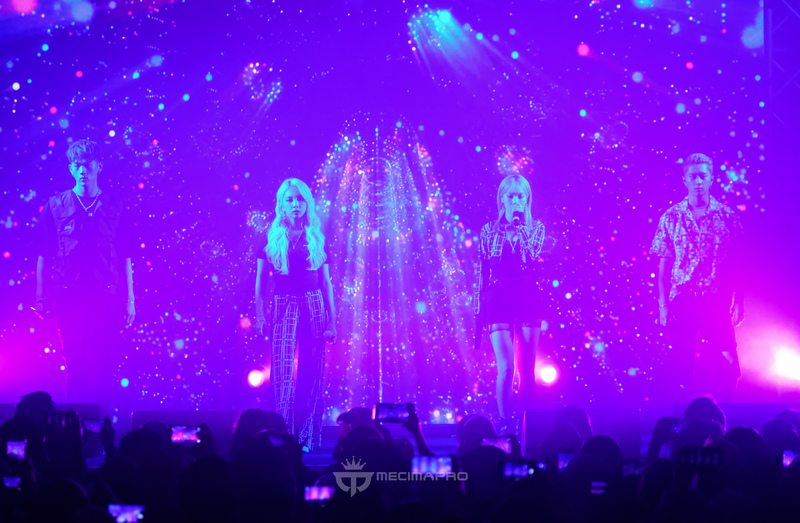 The group also express their gratitude as Indonesia HIDDEN KARD were still excited for the show and waited for them as previously the show was being postponed. When they were asked about their favorite song, BM answered that he likes “Living Good” as the song was dedicated for their fans and they’re thankful for HIDDEN KARDs support. While Somin choose their meaningful debut track, “Oh Na Na” due to its addictive melody. Jiwoo and J.Seph both choose “Don’t Recall” as their fave, Jiwoo explained that when she listen to the song, his mood will get better. The Q&A session continued with their experience of having an argument/fight within group. “Even in a family they can get into a fight, so it’s a common thing. We always try to understand each other to avoid it, ” said BM. While J.Seph choose to avoid having physical fight with BM as he knew he’ll definitely lost to him. As the session comes to an end, KARD (without Somin) giving a lot of spoilers for their upcoming song! They could spoil the whole song if the MC didn’t ask them to stop, we guess. So make sure you listen and watch their upcoming song on July 25! The spoiler was already that good, we’re 100% sure they won’t disappoint! WILD KARD goes on with members solo performance and fans couldn’t help but singing along with each of the member. “Side To Side” by Ariana Grande, and “24K” by Bruno Mars also delivered by the whole group heating up the venue once again. The excitement didn’t stop there, KARD continue with another dance song “Push & Pull” and “Hola Hola”. As the group saying their goodbyes to HIDDEN KARDs, they won’t leave the venue and chanting for encore. The quintet back on stage performing their debut song “Oh Na Na” and “Living Good” while everyone is jumping and singing along with them, marking the end of the show with a group photo. The members were all so excited meeting Indonesia HIDDEN KARD and promise to comeback again. The enthusiasm were all hitting the roof, making KARD and HIDDEN KARD were hard to leave the venue and separated. But we’ll wait for the next meeting with KARD with the new songs and performance! At last, we’d like to applaud Mecima Pro for another successful show this year and thank you for inviting KoreanUpdates to cover the great show. We can’t wait for the next show!